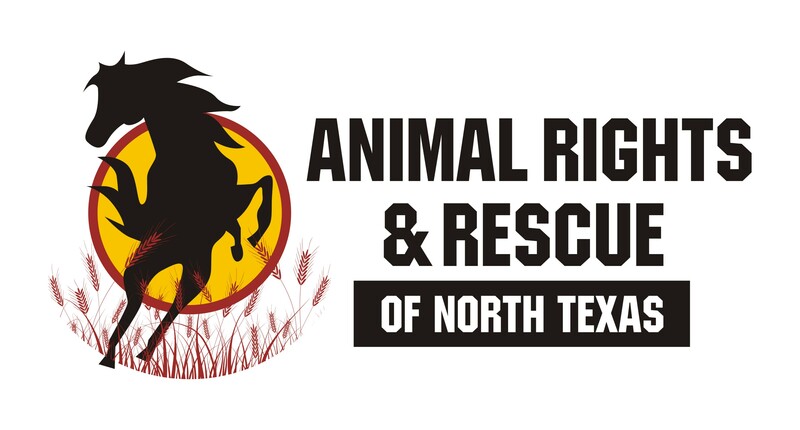 Welcome to Animal Rights & Rescue of North Texas! We are an abolitionist vegan advocacy group, working to create a new awareness and respect for all forms of animal life in the North Texas area. Everyone is welcome to attend our meetups and participate in our advocacy; all of us are in different stages of evolution towards a cruelty-free lifestyle. Please join us! Campus events always seem to be the most productive outreach events we have. World Vegan Day was no exception. 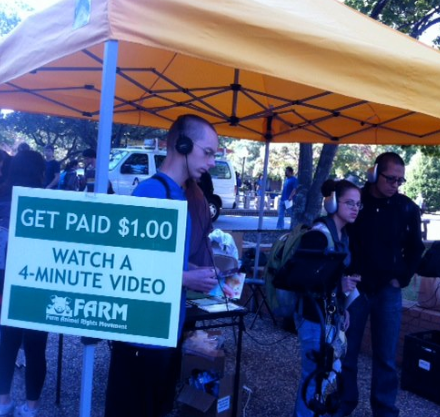 We meet witih dozens of students, offer vegan food to hundreds of people, and show Pay Per View to many others. Literature is usually passed out to thousands of people on campus, allowing us to reach many Texans. Best of all, most of the people we meet seem very receptive to the information we have to share. Join us for our next UTA campus outreach on 3/20/2013, to support the worldwide Meatout Event. Ours will be: Take the Vegan Pledge! It has been two years since the idea for Animal Rights & Rescue originated. It was my 63rd birthday when I decided to see if there were any other vegan activists out there that might want to leaflet with me. Six months seemed like a reasonable amount of time to test the waters, so I began a Meetup group, paid the first six months of fees, and waited to see what might happen. I was fully prepared to close it down if no one joined but decided it was worth the effort to see who might come aboard. To my surprise, a dozen people signed up for our very first meetup – and then not a single person showed up due a light snow in the morning. But it at least indicated there might be others who shared a concern for animals in the north Texas area, so we tried again. That first meeting had only four people, but three of them are still aboard. We recently passed 100 members on our Meetup site and plan to expand over the coming years. At the two year mark, we have not only survived — we are growing stronger. In the past month alone, we participated in three tabling events. We have collaborated with many other groups including: Vegan Club UTA, Metroplex Animal Coalition, Occupy Dallas, Mercy for Animals, Farm Animal Reform Movement. We recently connected with several other groups and plan to work with Animal Connection of Texas and Animal Rescue Corps over the next year. The impact we may have in the north Texas area and beyond is limited only by the energy of those who care enough to step forward. If you are an ARRNT member, thank you for joining forces with us. If you follow us, thank you for your interest. We would not have made it without you! On October 21, 2012, Animal Rights & Rescue proudly joined forces with Dallas Vegan and the Texas State Veggie Fair organizers to participate in one of the greatest annual vegan events in DFW. Every year seems to top the prior year, thanks to the hard work of the organizers and sponsors. Kudos to James Scott and his TSVF crew who have been willing to take on such a huge task. Reverchon Park in Dallas was the chosen venue and it was nearly perfect. The location afforded enough room for the music to play in the background, so the vendors could hear people that approached our booths. The indoors was not as crowded this year and offered climate-controlled temperatures for speakers and audiences. There was only a brief wait for the restrooms, and plenty of shade to keep us cool. The weather was even on our side (remember the mud puddles and early AM electrical storm last year?). There was plenty of free parking across from the park, and the unloading was super easy for the vendors. Best of all, there were numerous food vendors with too many selections to imagine. Char tried the ice cream sandwiches from Cool Haus and while pricey, she said it was well worth it. I saw other ARRNT members trying tacos, corn dogs, and lots of free samples. Ken Botts was a judge at the fried food competition – he had his socks blown off by the fried Frito Pie from what I hear! Vegan Thanks to Participants and Helpers! Thanks to Ellie, Millie, Dana and Marianne for helping staff the booth, and to everyone who attended and helped make it a very special event. We networked with several other groups: ARC (Animal Rescue Corps) is going to help us become contingent rescuers until we can get rescue trained. Some of their members have also been trained by Red Rover, as our group has. Animal Connection of Texas, our neighbors during the Fair, said they would like to collaborate on an event with us, too. We also had 30 people sign up to join us and each one was emailed an individual note with information about our group. We also were given over $100 in donations ($120), including the purchase of one tee shirt. One young man came by and dropped $40 in our donation jar – we wanted to track him down and offer him a tee shirt but couldn’t find him. Thank you kind sir! A special thank you to Char Duncan, our Vice President. Since this author was fighting off bronchitis and also had a migraine, there is no way the event could have taken place without her. She had already done double duty the day before at Paws in the Park, a River Legacy event to benefit local shelter animals run by Friends of Arlington Animal Services. Thanks, Char, for being such a trusted friend to animals — and to ARRNT! 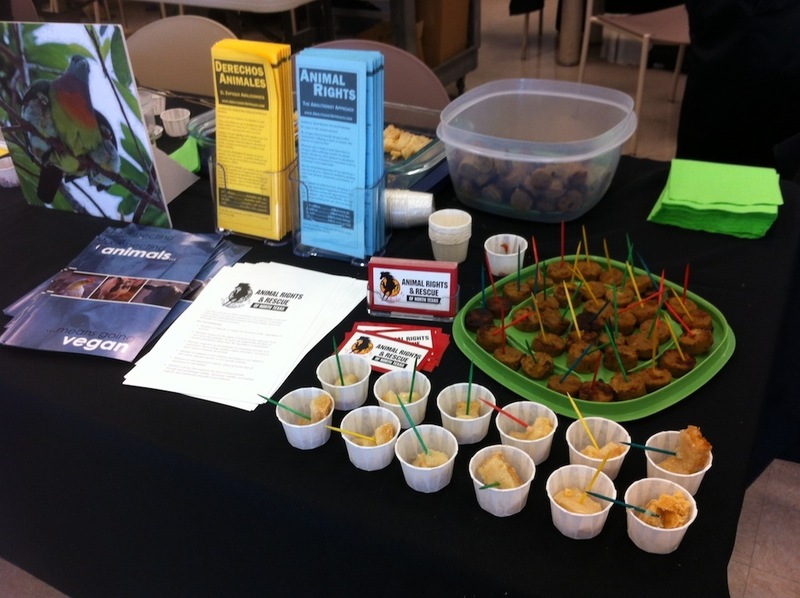 Another great collaboration took place with the Vegan Club of UTA on World Farm Animals Day, October 2, 2012. Margaret Strebeck and I met Ann Mai, president of the UTA Vegan Club, near the Planetarium, but discovered we had a dilemma. Our requested tables and chairs had not been approved. No worries – I have a folding table that is part of my CRV, so we brought that out and made a quick call to Millie Hunt Fain of ARRNT who brought a card table with her. Meanwhile, Nora Kramer of Mercy for Animals went to purchase a 6′ table for the Pay Per View. We offered hundreds of Field Roast Sausage samples (Apple Sage and Chipotle) and had not one complaint. Most students seemed impressed with the taste and texture. Ann Mai brought mini cupcakes with chocolate topping – they disappeared before our eyes! We had 46 students watch Pay Per View and many donated their earned dollars right back to Vegan Club. We gave out about 2,000 pieces of vegan literature and every student that watched Pay Per View was given a Vegan Starter Kit. One of the most rewarding aspects of UTA outreach is that the students may well read the offered literature cover to cover. Discussions at the table included Fair Trade, vegan nutrition, animal use, and transitioning to veganism. Those watching the Pay Per View also admitted they were surprised at what they witnessed. Thank you to VegFund for supplying some of our outreach materials and food; thank you to MFA for providing the Compassionate Choices booklets, too. Thanks to every ARRNT member who helps make these kinds of important educational opportunities happen. We view animals as fellow earthlings and are working to educate others about our amazing neighbors on this planet, to increase respect and understanding between all living beings, and to be advocates for peace and justice. Maintain an attitude of respect for all forms of life, regardless of species. Maintain respect for the rights of animals to live their own lives and not to be exploited. As such, we support the abolition of animal exploitation rather than the regulation of exploitation. Maintain veganism as the baseline for protecting animals from exploitation. By providing creative vegan education, we hope to teach respect towards all animals. Maintain an attitude of non-violence and peace in our relations with others, whether human or non-human animals. Maintain an anti-oppression stance, since we know that all oppression is interrelated. Maintain a group that supports the lives of local animals through rescue trainings; shelter, sanctuary, wildlife, and habitat support; and community education and outreach. HUNGER: A plant-based diet requires less resources and would help feed the world’s starving people. POLLUTION: Raising livestock destroys our waterways, pollutes the soil and air, and diminishes our quality of life. DISEASE: Eating animals has been linked to degenerative diseases such as heart disease, high cholesterol, cancer, diabetes and obesity. VIOLENCE: The extreme cruelty and violence that is inherent in using animals damages the human spirit and increases violence in the world. Adopt a vegan lifestyle. This will prevent thousands of animals from lives of suffering. Avoid the circus, rodeo, zoo, or aquarium for entertainment. Many animals are subjected to horrible lives of confinement and premature death for our momentary pleasure. Adopt, do not buy, if you want to live with an animal. Avoid support for animal breeding while animals are dying in shelters. Volunteer at your local shelter and encourage them to adopt the No Kill philosophy. Make certain you have made disaster plans for any animals living with or near you. Or contact us by email: ARRNTx@gmail.com. We are also on Facebook, Twitter (@ARRNorthTexas) and maintain a blog on the web (ARRNT.com). Because we have a number of members in the greater Dallas area, we decided to try a Meetup in Dallas for a change. 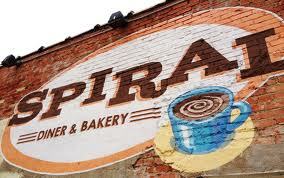 Where else would we begin exploring Dallas vegan eateries than the wonderful Spiral Diner? Our Earth Day event took place right down the street and some of us managed to sneak in for a quick ice cream treat to make the day even more glorious. Since that had been months ago, it was time to visit Spiral again. Not only does Spiral offer a wide variety of veganized comfort foods, but they have some terrific salads and inspiring desserts. One of the best reasons for participating in our Meetups is meeting wonderful people. This event was no exception, with a new person joining us for the first time — welcome, Mary! We also had members that drove down from Denton — we appreciate the effort and hope they will join us at the Veggie State Fair in October, too. We hope our vegan hugs made the drive tolerable! While there is nothing better than a Spiral meal, the acoustics make it very difficult to converse. Written updates were given out, but little business took place. We took in $20 in donations (thank you, thank you) which really helps, and looked at our upcoming events calendar. We also reviewed some potential projects for World Vegan Day and the State Veggie Fair in November and October respectively. We are waiting for quotes on a memorial tree planting plaque (WVD) and colored ARRNT tee shirts (SVF), as well as the cost of placing animal advocacy ads on the DART system. We are also needing to save up for our 501(c)3, so another garage sale may be in our future. Meanwhile, we are working to get a PayPal account for online donations – just a few more details to get it completed. Next Meetup will be at Loving Hut on August 4th at 4 PM. Check our Meetup page for other events! And please join our Facebook page as well! Fort Worth Employee Health Fair a Success! Only one person became challenging, stating she was from “PETA – People for Eating Tasty Animals,” and, tried to antagonize us. “I am not from the PETA you support.” We explained we did not support People for the Ethical Treatment of Animals but were an independent organization. Later, this same person came back, engaged us in conversation, tried the Field Roast sausage and admitted it was pretty good! It was a good reminder to never give back in kind, but to always give kindness back. 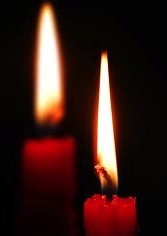 One never knows what will stay in another person’s heart. Our books and DVDs (from Compassionate Cooks) were taken early in the day, and more flyers and brochures were taken than at any other event. So many employees seemed interested in animals and rescue, but were not too certain about drawing the connections with their consumer choices. Since our table was right next to the Water Conservation table of the county water district, our graphic showing the water usage of one vegan meal versus one omnivorous meal was fortunate placement. Corporate events are a great way to reach out into the community, to network with other service providers, and to become more visible in the DFW area. Many people took our new informational sheet about ARRNT as well as booklets about animal rights and veganism. These events allow us to answer questions, present resources and offer giveaways to people. If you have not been to a tabling event, it is a wonderful way to plant seeds of peace and help our neighbors live a healthier, kinder life. And most of all, they help us get the word out about other animals! We have already scheduled three more corporate events for calendar year 2013.